Are Braces Necessary for Me or my Kids? All of us remember THAT kid in school with the big braces, or perhaps you were that kid…and suffered taunts like “metal mouth!” Braces come with a lot of negative feelings for many people – the look, the discomfort, the expense, and so on. However, things have changed, and there are now braces available that are much less obtrusive and much easier and more comfortable to wear. In recent times, it’s become quite usual to see adults with braces. You might be asking yourself why an adult would voluntarily get braces if they’d managed to avoid it in childhood, so let’s have a look at the reasons why both children and adults may need braces. • If they lose their baby teeth before they’re five. • If their teeth don’t meet properly when they bite down. • If they mouth breathe and/or snore a lot. • If their front teeth are crowded – which you won’t typically see until they’re around seven or eight. • If they have protruding front teeth. • If they have a speech impediment. • If you can see that their jaw moves when they close their mouth. • If they’re still sucking their thumb post five years of age. Getting your child’s teeth assessed at an early age can mean that you may be able to correct an issue before it causes significant problems. The later it is left, the more there can be to correct, which can both prolong treatment and cost more. Adults often report a rise in self-confidence once their teeth have been treated and are neat and even. 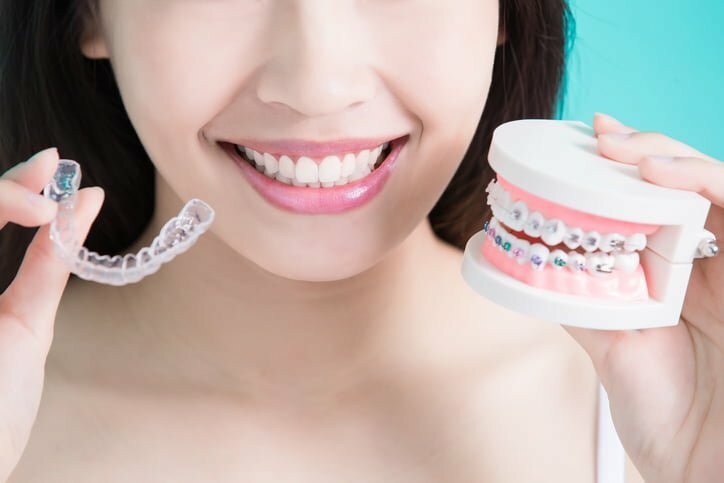 Advances in the types of braces that are available have certainly made it less off-putting for adults to look at rectifying crooked teeth, as many of the new forms of treatments are much less obvious than old-style metal braces. • They have crooked, crowded or misaligned teeth. • Their teeth are protruding. • They have an underbite or deep bite. • They have an asymmetrical jaw or facial asymmetry. • Their teeth have significant gaps. • They require realignment of their teeth prior to future cosmetic or remedial dentistry. For children and adults alike, straight and evenly-spaced teeth are easier to clean, in addition to having obvious cosmetic benefits. So, if you feel you need to get your teeth assessed, book an appointment with one of our cosmetic dentists in Sydney. We offer a range of treatments for children and adults.